Being one of the most famous tourist attractions in Vietnam, Phu Quoc is an ideal place for your vacation as well as sea exploration. In Phu Quoc, there are several towns and villages, all of which alternate with another, with the presence of various pretty beaches and the amazing tourist destinations. Here is our suggestion of the must-visit towns and villages in Phu Quoc tours. 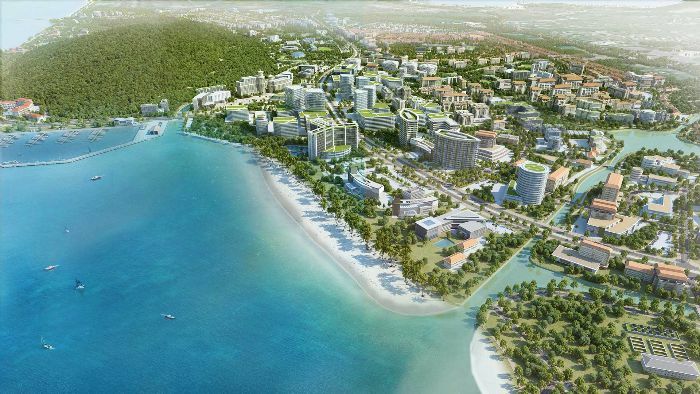 Being the second largest town in Phu Quoc, An Thoi is a place where is the location of the main ferry port importing products from the mainland. It is also the starting point to visit the chain of An Thoi islands in the Southern part. An Thoi offers many goods and services. Many of the island's fish sauce factories are located here, together with the naval bases of the island as well as the second largest local market selling a wide selection of seafood, fruit, vegetables and much more. There are some hotels, banking facilities, and travel agents and a small hospital here. This gives easy access to the Southern islands and is closer to Kem and Sao beaches with their pristine white sands. The available taxis are willing to take you to your expected destinations on the island. Situated on the western edge of the island, Duong Dong is Phu Quoc's the largest town and is the place where you can find the best choice of goods and services from accommodation, restaurants, banks, travel agents, the local markets and various shopping options. This is also the administrative center where you can easily find the island's hospital together with postal services. Cutting through town and towards the entrance to the ocean, Duong Dong river is full of blue fishing boats heading out each evening. There are also some fish sauce factories in the town if you’re wondering about that special smell! Being 32 kilometers away (by road) from Duong Dong town, Ganh Dau is situated in the northwestern coast of the island. In this village, visitors can clearly see the Cambodian coastline that is just a few kilometers away. Ganh Dau has been still one of the most peaceful beaches on Phu Quoc although it is no longer closed to tourist development as they did a few years ago. Ganh Dau includes the scenic same-name beach and a few kilometers to the east is Long Beach. Being a fairly small fishing village, Ganh Dau is where you can get basic supplies such as petrol, food, haircut, etc. 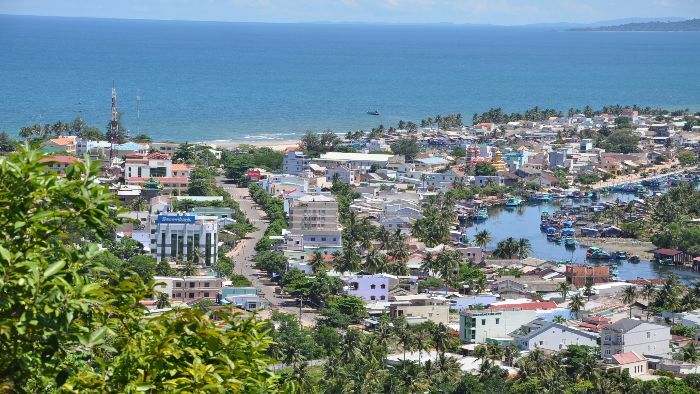 Ganh Dau village will give visitors a taste of Phu Quoc ancient typical lifestyle with scenes of anchovies dried out in the sun to make fish sauce, children playing happily and lots of fishing boats in the port. Located on the east coast of Phu Quoc island, Ham Ninh fishing village is usually included in most tours to the Pearl Island. Ham Ninh's most famous attraction may be the nightly fishing tour catching delicious squid. Seemingly tourists often don’t catch any squid, but that doesn't matter since there is still crew. The catch is prepared right there on the boat, for a great late dinner on the sea waves. Ham Ninh's scenery is picturesque. At the pier, you may meet groups of children selling starfish that they collected in the shallow sea. Following the pier, you will find the seawater gradually getting deeper until the particular depth where the smaller fishing boats are moored. In the right and left sides of the pier, there are restaurants providing a gorgeous source of seafood, including various local crabs, lobsters, and mussels. You may take away or eat directly there. The fresh seafood can be grilled, steamed or even eaten raw with salt, pepper and lime juice. The exquisite will surely boom in your mouth. Besides, Ham Ninh mountains in the Western part runs for 30 kilometers along the coast, with the highest peak of Mount Chua, which is worth exploring. 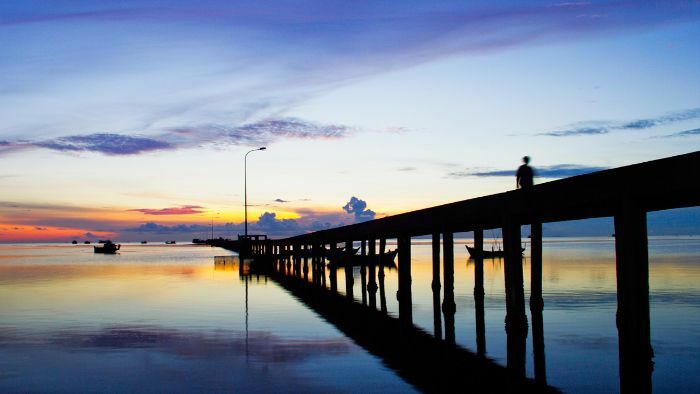 Le Bat is a picturesque tranquil tiny hidden fishing villages on Phu Quoc, which seems to be strange to tourists. Actually, there is nothing special there but the spectacular natural landscape for photographers. You will easily pass this hamlet on the way to Vung Bau beach. To reach Le Bat, go along the paths from Duong Dong to Cua Can. To the North of Ong Lang beach, you will cross a bridge and then turn left. Keep going and you will see Le Bat. In the case of traveling by motorbike, you will catch a scenic road, where your camera can flicker continuously. Besides soaking in the cool sea water or exploring the renowned tourist spots, it’s a good idea to wander around Phu Quoc’s towns and villages and have a glimpse at the daily lives of the settlers and get the authentic experiences. Do not forget to visit these above towns and villages and you will surely get the marvelous moments.